On the average, October 18th is the first day of winter when the temperature does not rise above freezing. Brrr! Still, much colder weather lies ahead. As we slip into another winter season, we send you our most sincere thanks. Your prayers and your contributions are what keep this mission radio station strong. Thank you for both! Please accept our most sincere appreciation for the many expressions of sympathy you have sent following the death of our owner, Bishop Michael Kaniecki, SJ. We thank you for joining us in prayer for this great leader, who was a close personal friend to many of us. (ah-MAH-suk), distributing chum salmon to families who traditionally depend upon subsistence fishing. The State of Alaska purchased 15,000 pounds of fish for the Nome area, to help relieve hunger caused by the region�s disastrous salmon runs. 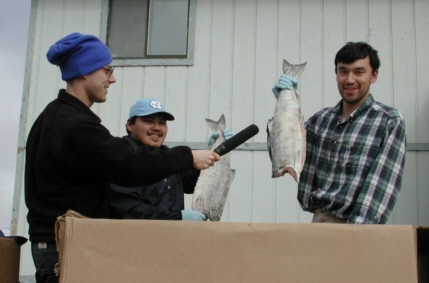 The fish were caught near Kotzebue (KAHT-zeh-byoo), 175 miles to the north, one of the few spots in Western Alaska where salmon arrived in abundance this year. WINGS-DAY: By the time you receive this, KNOM general manager Tom Busch will have humbly accepted the year 2000 Gabriel �Radio Station of the Year� Award. Watch for a photo next month! Tom planned to accept the honor on behalf of all of KNOM�s benefactors. For it�s you who make this important work possible, 24 hours a day. INSPIRATIONAL SPOT: Some of God�s attributes are too wonderful to understand. But even if they remain darkness to the intellect, let them be sunshine for your soul. top The oldest Catholic radio station in North America, KNOM beams inspiration, education, encouragement and companionship throughout 100,000 square miles of rugged western Alaska. 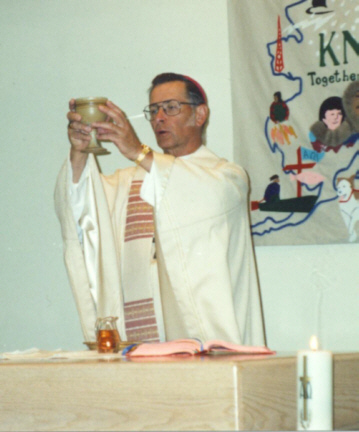 IN OUR GRIEF last month, we forgot to mention that KNOM aired Bishop Mike Kaniecki�s 2-hour funeral Mass live from Fairbanks� Sacred Heart Cathedral, and we received many words of thanks from our listeners. Fairbanks is over 500 miles from Nome, and the broadcast was made possible by long-time Fairbanks broadcaster Pete Van Nort, a former KNOM volunteer. Thank you, Pete! SEEING RED: It may have been caused by the cool late summer. It may have been caused by the incessant rain of late August and the first days of September. For whatever reason, the tundra inland of Nome turned brilliant around Labor Day, with the usual bright rust and gold, punctuated by incredible splashes of dazzling crimson, mostly from large patches of ground-hugging low bog blueberry leaves. It was gorgeous! Some plants gamble on winter�s late arrival and remain bright green. The contrast is magnificent. Thank you, God! DC POWER: Nome and remote St. Lawrence Island were hosts to U.S. Deputy Secretary of State Strobe Talbott recently. Governor Tony Knowles accompanied Talbott, who flew to the area to familiarize himself with travel by Alaska Natives across the border with Russia. According to agreements worked out several years ago, Natives from this region can travel to Russia without formal visas. As you may know, many coastal Alaskans have close families on the Russian side. Thanks to donated airfare by a local airline, KNOM volunteers Victoria Pasquantonio and Olin Fulmer flew to the village of Savoonga to cover the visit. Meet incoming KNOM volunteer Andrew McDonnell (left). A native of South Bend, IN, Andrew graduated from Notre Dame University in May with a degree in English. 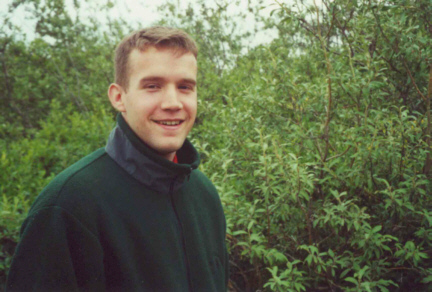 22 years old, Andrew is impressed by the friendliness of Nome�s people. �It�s like being on campus,� he says. In his spare time, Andrew enjoys reading, writing, hiking, and playing board games. Welcome, Andrew! 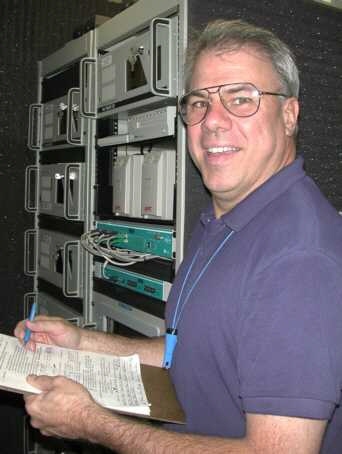 Meet KNOM program director RIC SCHMIDT (left), checking the KNOM audio computers. Ric was born in Albany, Oregon, and first came to KNOM as a Jesuit volunteer in 1984. At KNOM, he met his future wife, Lynette Berger, who was volunteer news director that year. He was the founding general manager of Portland�s Catholic radio station KBVM-FM, which he headed for seven years before returning to KNOM five years ago. As program director, Ric is responsible for KNOM�s �sound� and coordinates all non-news programming. Ric and Lynette have six children, ages 4 through 12. That doesn�t allow Ric much spare time. However, he serves as treasurer for Nome�s Rotary Club, he�s on advisory boards for Nome�s school and the local University of Alaska campus, and he�s a director of the Alaska Broadcasters Association. In his spare time, Ric enjoys playing with his children on the wilderness Nome beach, reading books and just being a father. 26,300: That�s how many inspirational spots KNOM has broadcast this year, plus an equal number of educational spots on topics like health, education, history, science, child care, Eskimo culture, domestic violence and recovery from alcohol abuse. Since signing on the air in 1971, KNOM has aired approximately 767,000 inspirational spots. A listener who has tuned in 3 hours a day throughout that time has heard an incredible 130,000 of these spiritual messages! and news director Paul Korchin at news@knom.org. INSPIRATIONAL SPOT: Oh God of second chances and new beginnings, here I am again. top THIRTY YEARS AGO: The frozen ground was too solid for shovel or pick, and it was a race against winter to dig the foundation for the KNOM tower and guy anchors. 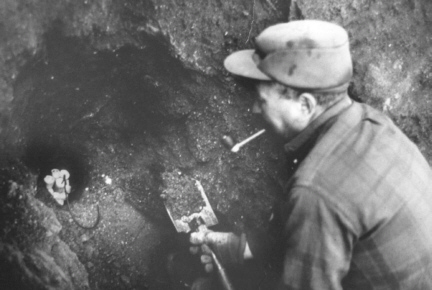 Volunteers John Pfeifer and Tom Busch heated 3-foot chisels in a driftwood fire and hammered the red-hot ends into the tough permafrost. An hour of hard pounding melted enough of the frozen gravel for a dynamite charge to be planted. (Left) �Powder monkey� Sam Tucker packs a six-sticker, about ten feet below the surface. Following each blast, it took an hour for John and Tom to shovel the resulting debris into a bucket and haul it to the surface. After 25 continuous days of picking, blasting and bucketing debris, the main tower hole was deep enough, 18 feet, but far too narrow. Using an old miners� trick, volunteers Tom Karlin and John Scheussler filled the hole with driftwood, added five gallons of gas and tossed in a match. Miraculously, the resulting explosion injured no one. The fire raged for 10 hours. Although it widened the hole, it filled it with fast-freezing muck, to within 5 feet of the surface. Bucketing out the debris took 16 hours. Karlin and Jesuit Brother Randy McIlvain quickly rigged the four holes with steel rebar reinforcing networks, and the next day, poured concrete. The temperature was already dropping below freezing every night, and the crew assembled makeshift lean-tos of scrap lumber and plastic sheeting around the concrete piers. Seven days later, a crew arrived from Utility Tower Company. (Left) October 25, 1971, workers use an A-frame to hoist the first sixty feet of tower into place. 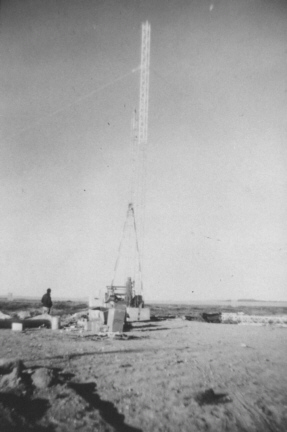 They assembled the 230-foot antenna in three work days, which were interrupted by three days of snow. The tower was completed October 31st, beating winter by 48 hours. November 2nd, a string of winter storms began to lash Nome with two continuous weeks of sleet, high wind and driving snow. THANK YOU ONCE AGAIN. Your prayers and your financial support keep our signal strong. INSPIRATIONAL SPOT: Perhaps if we could see the splendor of the land to which our loved are called from you and me, we�d understand. Perhaps if we could hear the welcome they receive from old familiar voices, all so dear, we would not grieve. Perhaps if we could know the reason why they went, we�d smile and wipe away the tears that flow, we�d wait content. INSPIRATIONAL SPOT: If you always do what you've always done, you'll always be what you've always been.